Talya Buckbinder will be our soloist on January 6th. She and Larry will present music by Vivaldi and Schubert, and Saint-Saëns “The Swan”. Talya’s musical career began at the age of ten, when she picked up the cello for a school project and never put it down. Growing up close to New York City, she attended the Mannes and Juilliard pre-college programs under cellists Barabara Mallow and Bonnie Hampton, and soloed with the Juilliard Preparatory Orchestra. She received her undergraduate degree from the New England Conservatory and her graduate degree at the Juilliard School, her primary mentors being Paul Katz and Natasha Brofsky. 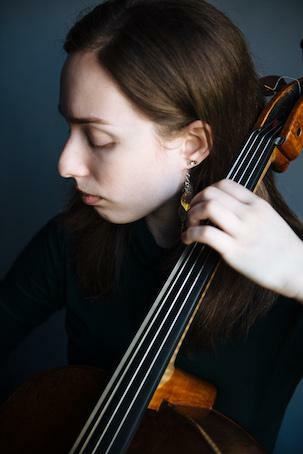 Talya attended the Perlman Music Program and their affiliated residencies from 2007 to 2014 and has participated in summer music festivals at the Banff Centre, Tanglewood, Taos, and Yellow Barn, where she discovered her love for chamber music. Her most memorable experiences are those in which she has worked and performed with renowned musicians such as Itzhak Perlman, Alan Gilbert, the Weilerstein Trio, Alfred Brendel, and members of the Shanghai, Cleveland, Brentano, and Juilliard String Quartets. Recently, she has performed with east coast-based ensembles, including the Orpheus Chamber Orchestra, the New York Classical Players, Symphony in C, the Secret Opera Company, Shattered Glass, and the New Jersey Symphony Orchestra. During her time in New York she performed at Carnegie Hall under conductor Alan Gilbert, and was also a member of the Synesthetics, a contemporary band collaborating with The Art of Circus company, as well as the Astoria Tango Orchestra. In addition, Talya has performed in places such as Israel, China, Brazil, the Kosciuszko Foundation, the Neue Galerie, and Thirteen’s Great Performances on the PBS channel. She finds that she can touch audiences best when she offers a lighthearted, yet genuine presence in her concerts, and hopes to use this blend to inspire others with classical music. Talya’s interests outside of cello include studying foreign languages, the outdoors, and holistic health.